I've always been a bit ambitious. In elementary school, it was all about my studies. I remember sobbing upon getting my first C on a test in 5th grade. That's when my teacher pulled me aside and, essentially, told me I needed a hobby. Other than school. So enter my middle school years...I found a passion in playing basketball. While I was a bit rough around the edges my first year, I was on the starting line up the following season and captain the year after that. When high school came around, I continued the sports and studies while adding in a few extra responsibilities on the student association and as Vice-President of my class. In college, I applied to every internship I could find, landing a few that would launch me into my marketing career today. All that to say - I pour my heart, my soul, my everything, into whatever I do. I can't help it. The past year was no different. 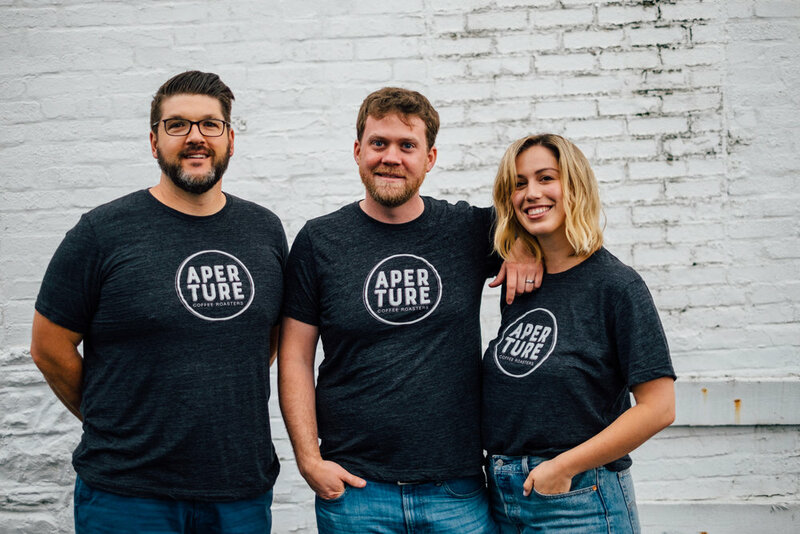 We started out last year by announcing our pregnancy, and within a few months, a new business (Aperture Coffee Roasters) as well! The hubby manages the finances and roasting, while I run the marketing, photography and social outreach! Between the new and exciting additions to our life and our regular 9-5 jobs and the blog life, I'll admit things have been pretty nuts around here. 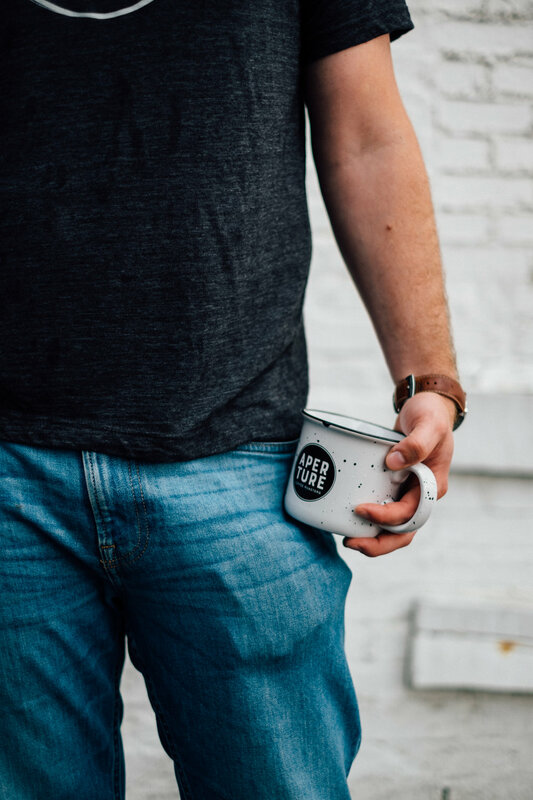 As our coffee business grew, I realized we had a terrific team with an incredible skillset, but we needed something more than "let's all wear black to our next coffee tasting" to represent our brand. Enter: Custom Ink. I had quite a few friends who have used Custom Ink for special events like bachelorette party tees and team shirts for sports teams, so I knew their quality was exceptional. When they reached out about partnering on getting some gear for our coffee business, I could barely contain my excitement. I'll admit, I held off on ordering for a few days because I was scared that it might be complicated to get started. Now that I look back, I should have started sooner - everything was SO easy with the Custom Ink Design Lab! I'll give you an example: I started off by uploading our white Aperture Coffee logo to the Design Lab, thinking I'd need to go into illustrator and change the color and re-upload. Wrong. I was actually able to change the color of the logo within the website! And that's how we ended up with a faded grey logo on a dark grey tee. We wanted the whole look to feel subtle, less 'in your face' to align with our brand. When it came to choosing our tees, there were plenty of brands to choose from like Adidas, The North Face, Champion, Hanes, Nike, Under Armour and Comfort Colors. I loved that I could see the product on a person too so I could get a better idea of how the tees might fit. And they're really size inclusive too - with ranges from infant to 6XL. And if you're local to the DC area, you can actually go to the Custom Ink headquarters in Mosaic District and check out everything in person! We had our hearts set on some custom mugs as well, and we were SO pleased with how these ceramic camping-style mugs turned out. The quality is phenomenal. We've been testing them over the past few weeks to ensure they meet our standards and they've passed with flying colors. I can't wait to use these for our classes - makes me feel *so* official! Not into t-shirts or mugs? Custom Ink also does custom hats, bags, drinkware, tech products, office supplies and more! Whether you're getting married, have a family reunion, working on a fundraiser or own a small business like us, Custom Ink has all the tools you need to get custom gear. Special thanks to Custom Ink for partnering on this post!